Lights begin to flash in a darkened Consol Energy Center. The clang of bells can be heard over head- Metallica's "For Whom the Bell Tolls". The announcer demands to "Make It Loud" and the Pittsburgh Penguins take the ice for the usual pregame ritual. The crowd stands, the starting forwards and defensemen take their places on the blue lines, and as that night's singer begins the national anthem, 22-year-old Derrick Pouliot stares down at his team from the press box....again. When David Warsofsky and Elite defenseman, Kris Letang, were taken out of the line up by injury, and Adam Clendenning traded, fans finally got what some had been begging on social media for since November when the team was struggling to just stay above water - they called up Derrick Pouliot (who had been playing for the Penguins minor affiliate, Wilkes-Barre). However, since acquiring Justin Schultz at the NHL trade deadline,"Pouli" has been a healthy scratch and the only uniform he has donned are the ones he wears for practice. The reasoning behind this move has just about everyone in the fan base scratching their heads and wondering if history is to repeat itself once again. 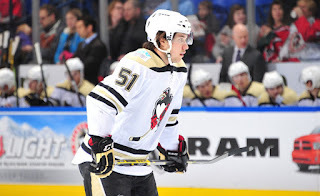 Derrick Pouliot was chosen in the first round, the Penguins #1 pick (8th overall) in the 2012 NHL draft. Not only boasting a strong build (6'0, 208 pounds), he was touted for his ability to generate offense as well as being an explosive skater and aggressive player. 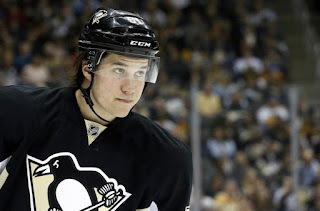 He was called up in Dec. 2014 from the AHL when the Penguins were once again plagued by the curse of the injury bug. To much joy, Pouli would score in the first period, but it would be one of the very few highlights during that time period. He would play in 34 games in the NHL that season and score only once more and tally only 5 assists. Despite being given great match-ups and zone-time and showcasing his dynamic skating ability that made him such a high pick consideration, he would end up heavily out-manned. Critics didn't want to be to hard on the kid. He was thrown into a role quickly and out of mere necessity and was expected to be at the same level as other defensive stars right off the word go. This was not the case and the nightmarish scenario would continue and then only get worse. When the season ended with an early exit from the playoffs, it was clear the Penguins had more work to. Training camp opened that fall with high hopes and a renewed positive outlook for the season to come. Needing young defensemen to step up in order to make the 2015-2016 season a successful one, it came as a shock and surprise that it was Brian Dumoulin who would end up making the biggest impression during camp and not Pouliot. It became increasingly clear that Derrick would need more time to develop and, in the eyes of Penguins management, was not ready to be the "go-to" man. Back to the AHL he went. We all know making a good impression is always important, but when already struggling, one mistake can have reputation tarnishing results. It doesn't matter if it is on or off the ice. That is just what happened in Nov. 2015 when, after a night of frivolity, Pouliot was arrested for public intoxication after an argument erupted with a taxi cab driver. This kind of behavior is not looked upon well within the organization, and after speaking with management, Pouliot's future was put in his own hands. Never one to mince words, General Manager Jim Rutherford along with Mike Sullivan (who was the head coach in Wilkes-Barre at the time) put Derrick on notice that "any long term impact on his career hinges on how he comports himself in the future". In other words "We have our eye on you, kid. Screw up again and you're gone". Since his little run in with the law, Pouliot has stepped up his game with the Wilkes-Barre/Scranton (WBS) "Baby" Penguins. So much so that his 6 goals/17 assists/23 pts over the 34 games he had played there earned him his second AHL All-Star game nod (note: Derrick is not currently listed on the active WBS Penguins roster). Those numbers may not seem impressive, but they are par for the course for a defenseman who likes to move the puck as much as he does (much like break out star defensemen, Shayne Gostisbehere). Since the call-up, Derrick is a +3 and has tallied 6 assists in the 18 games played but has not scored. When compared to the other defensemen over 60 minutes of play, he ranks second behind Justin Shultz (who JUST got here) in point production (1.20). What is more impressive is that, when he started being paired with Ian Cole (who was struggling himself before a nice, long ride on the pine pony), Cole's play improved tremendously. Pouliot was, generally speaking, playing smart hockey. He was a bit hesitant and "safe" when he first arrived and started seeing ice time..a more "stay-at-home style of defense. That did not last long. He started to come into his own and was gaining more and more confidence each time he played. You can tell he believes in himself and his abilities the most when he is making moves with the puck, going to the net and trying to contribute to the success of his team offensively. By all accounts, Derrick was being allowed to develop in and on his own time. A rather smart move by the organization in regards to this individual player. That all came to a halt when the trade deadline hit. With Schultz added to the team and soon after added to a defensive paring someone had to sit out and there were only 2 options. Rumor has it that the coaching staff is "hesitant" to put a veteran acquisition together with a developing prospect. In an organization that has a (increasingly bad) habit of choosing veterans over youth (based solely on game experience alone in many cases), it was Cole who got the nod and Pouliot who got the nachos. The extra time spent in the AHL developing and honing his skills is now going to waste. He has not played since the beginning of March but there seems to be no interest in sending him back to the Baby Pens. Is Derrick playing his best hockey? Nope. Is he playing any worse than Cole was the entire first half of the season? Nope. But he isn't going to get any better or learn "the right way" or realize his true potential with just practice time or by sitting on his Canadian backside in a suit and tie. The Pens are on the tail-end of a play-off race, I get that. 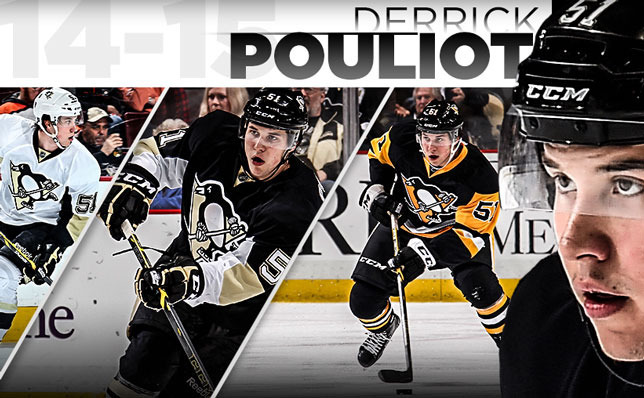 While I agree not taking chances defensively is a smart move, why keep Pouliot around if he isn't going to play? Why not send him back to Wilkes-Barre so he can at least keep playing and keep building his game? Is it something contractual, management just being stubborn, or something else being kept on the down low (the extreme down low)? From what I have seen, Derrick Pouliot has the potential to help the "new" speedier Penguins a lot more than someone like Ben Lovejoy. Lovejoy has experience and history with the team, but struggled for most of the season until about 2 weeks prior to his injury. Pouliot brings speed, a big upper body (and doesn't seem to fear using it from time to time anymore), and a offensively minded defense that can help get points on the board. Ben Lovejoy is also an unrestricted free agent at season's end. That last tid-bit could bode well for the young defenseman.